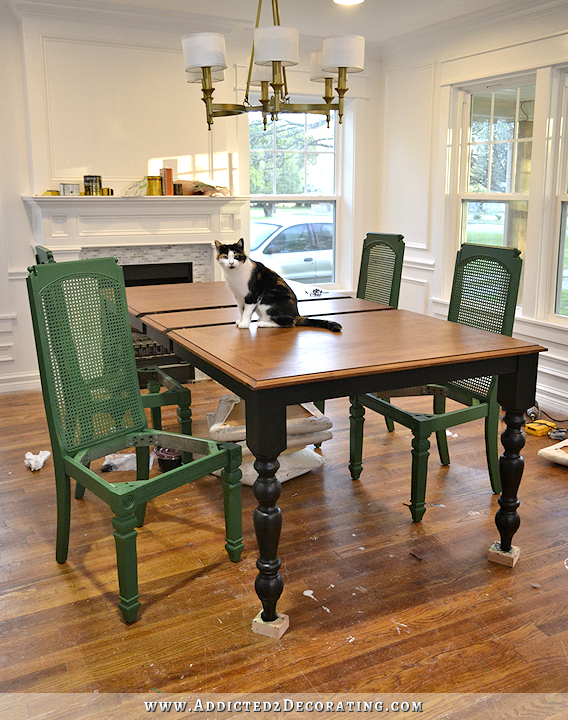 On Friday, I had a farmhouse dining table with a stained top and green base, right? Right. I loved how that looked, but I decided it would only work if I used that table with dining chairs that were painted black and had the stained cane backs. I just didn’t want solid black chairs. 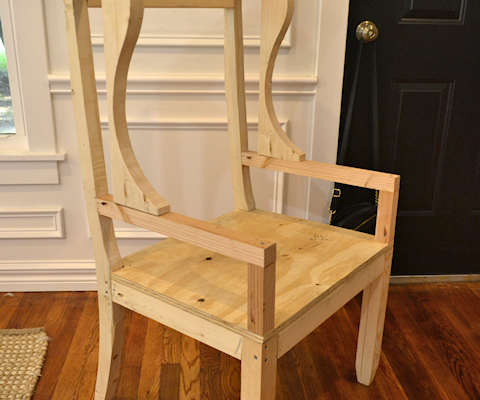 So Friday morning, I got to work on one of the chairs. The cane backs on these chairs were looking pretty rough because the finish had been worn off of them in spots, so the finish was really blotchy. I figured I could fix it with new stain. Wrong. I tried two different products — Restore-A-Finish, which is one of those products that says you don’t have to strip anything and it’ll make it look like new again, and Rust-Oleum stain. The Restore-A-Finish didn’t work at all. I had a bit more success with the Rust-Oleum stain (I chose that because it’s kind of the middle of the road between a penetrating stain and a gel stain), but after it dried, it still looked really splotchy. I’m sure I could have added several more coats to get everything a uniform color, but with more coats, the cane would have just gotten darker and darker — almost black — and that would defeat the purpose. At that point, I basically had two options. The first option would be to completely strip the cane and then stain it. Well, I’m pretty dedicated to DIY, but the thought of completely stripping the cane backs on six chairs just seemed foolish to me. The other option, of course, was to paint them. And while I was working on the cane back, and failing to come up with a solution that actually worked and looked good, I got a delivery from UPS. 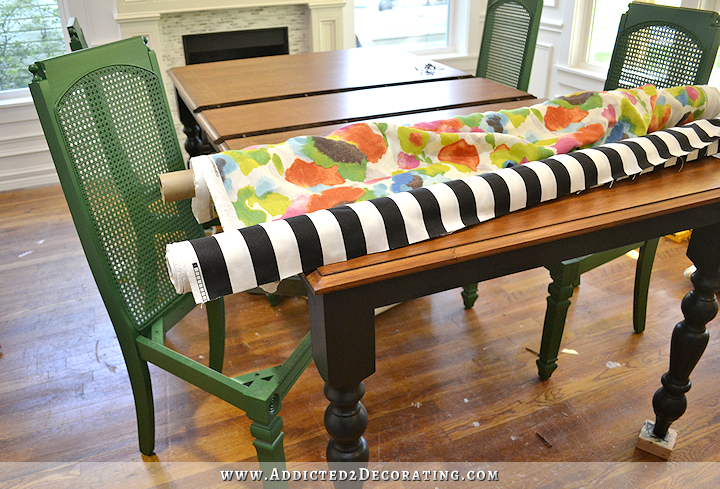 It was the black and white striped fabric that I had ordered for my chairs when I had planned to paint them green. So I decided to change directions. 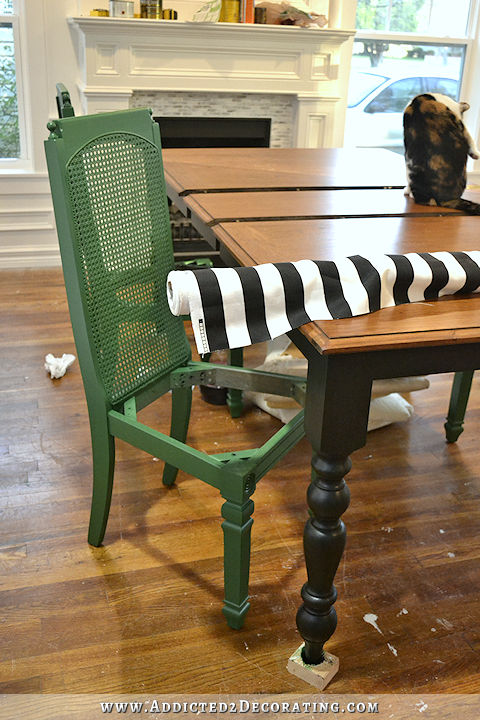 I gave the table a coat of black paint, and then started prepping my chairs for paint. Green paint. The table still needs another coat of paint, but the chairs are completely painted. I used my Critter sprayer* to paint them (I can’t imagine painting cane backs any other way), and it went pretty quickly. Those chairs took quite a bit of prep work, though. Two of them were really wobbly, so I had to use lots of wood glue, screws, and clamps to get them sturdy again. And while I was at it, I went ahead and added all new screws through the inside corner braces on the other four side chairs just to make sure they would stay sturdy. Then I sanded all of the chairs by hand with 150-grit sandpaper, primed with oil-based Zinsser Cover Stain (sprayed with my Critter), sanded them again with 220-grit sandpaper, and then finished up with two coats of Sherwin Williams Derbyshire mixed in Behr satin finish paint. I still have to reupholster the seats, but here’s a peek of the fabric that I got. I got it here, and it’s a great fabric. I’m always concerned that the whites in fabric are going to look off-white or cream or even taupe in person, but this actually looks white. And the fabric was a great price at only $8.98/yard. It’s also a great weight for dining chairs, pillows, draperies, etc. I wouldn’t really use it to upholster a sofa, but for smaller items or items that won’t get as much wear and tear, it’s great! And here’s a look at everything along with the colorful watercolor fabric I’ll be using in the two end chairs. I’m hoping to get the side chairs upholstered today, and if I can get the second coat of paint on the table base, then I’ll actually have the major dining room project finished! (Well, except for building and upholstering those end chairs.) The next biggest project will be draperies, and I’m still undecided on those. I just can’t seem to land on an idea that really makes me excited, but maybe having a finished dining table and chairs will help me with that decision. Good change. I think the table looks better in black. oh so agree…black is far better choice…good going Kristi! I agree with Laurie, I like the black on the table and the green on the chairs. I am figuring our at my advanced age that if you think you always have to stick with your first choice in design you are either going to be unhappy or unproductive. I agree with you there. I often feel if I don’t go with my gut instinct and it turns out ‘not so great’ I’m slower to do another project. I love the black here.. The sprayer that I use is made of all metal and glass, so it’s perfectly safe to clean it with mineral spirits. After I clean the glass jar, and clean all of the exposed parts, I put a little bit of mineral spirits into the jar and spray it so that it cleans inside the sprayer. I would be very careful about using mineral spirits on plastic, though. I’m sure the owners manual that came with your sprayer will tell if you can use it with oil-based products, and if so, what you should use to clean it, and how to go about it. Also do you clean your sprayer out between coats? Like if you spray a coat and you have to let that dry do you clean out your sprayer until you have to spray your second coat? The straight pin is a neat idea. My critter sprayer got gummed-up in-between coats of latex (it was a hot day and everything was drying fast) and once that happens, it can be a production to get it clear.. I’ll bet the pin helps a lot. I really wish they’d make a bigger version of the Critter sprayer that sprays a bigger area and takes quart jars for larger projects (which I suppose you could do anyway if you made the straw longer). It’s really a great tool. Kristi, I bought the critter sprayer because of your review. I used it on a set of chairs. The finish was grainy. Not smooth at all. I tried adjusting the pressure, adjusting the nozzle, diluting the paint to no avail. Does yours come out really smooth? Oh, I hate to hear that! I’ve only had that issue with oil-based primer, but it didn’t bother me since I always sand my primer with 220-grit sandpaper before painting anyway. What brand of paint did you use? Could that be the issue? I know some paint brands are thicker than others, and since the sprayer does spray out a mist of paint, if the paint is too thick it could just sit there on the surface, producing that grainy look/feel. And I wonder if paint conditioner would help any. It sounds like the paint is drying too fast, and not being given time to smooth itself out once it’s sprayed onto the surface. One of the things that paint conditioner does is extend the drying time of the paint, giving it time to spread out and even out before it really starts to dry. I hope you can find something that works — either paint conditioner or another brand of paint. Because I absolutely love my Critter, and I always get such a beautiful finish with it! Oh…one more thing…you might also try turning the pressure down as low as it can go while still spraying the paint out enough to coat the surface. It could be that if you have it turned up too high, just the force of the paint mist being propelled through the air at such a high speed could be actually drying out the paint a bit before it even hits the surface that you’re trying to paint, causing the paint to hit and stick in tiny little droplets. Hope that makes sense! I keep my compressor set between 90 and 100 when using my sprayer, but other compressors might be slightly different. I’ve hit the grainy thing with the critter and Behr paint as well, but it wasn’t a huge problem since I was planning to use a wax-based finish and that smoothed things out in the end. I think the cause was a combination of a few things. For one, I was spraying outdoors on a hot summer day. I think Kristi’s right about it drying before it can smooth out. I bought some floetrol but haven’t tried it yet. I may have to use it on my next project because I bought the “paint with primer” product (not thinking) and I have a hunch it’ll be too thick for the critter on its own. I also hit it whenever there was moisture in the line. Small pancake compressors will accumulate condensation inside the tank. The simple way to remove it is to de-pressurize the tank using the drain on the bottom. If you put your hand in front of the air as it comes out the plug, you’ll actually feel the water spraying out. I think they sell inline filters you can use, too, that catch the water before it hits the sprayer. That’s why you see a big focus on electric sprayers being “airless”, which don’t use air to propel the paint, so they can’t pick-up any water. I also had problems after cleaning the sprayer with mineral spirits (as Kristi described above). I had to spray quite a bit of extra paint to get a nice spray again the next time I used it. I assume there was residual mineral spirits in the gun and it was essentially over-dilluting the paint. In your case, I wonder if maybe dilluting the paint with water is the root cause. Maybe you’d have better luck with the floetrol. I forgot to say…when I first got my Critter, it seemed like it took me forever to get it set just right so that it would spray enough paint and leave a nice finish. I don’t know why I had such a hard time with it at first, and I almost gave up on it. But I kept working with it, and after about 20 minutes or so, I got it perfect. Now I just know how everything is supposed to be set, so it’s much easier. But that very first time was a pain, but I’m so glad I didn’t give up! Now having used the Critter and also my new Wagner Flexio which comes with a detail sprayer for furniture and smaller items, I can tell you that I much prefer the Critter for furniture. The finish is so much nicer, and the spray is much more even. Don’t give up! I hope you can get it set just right so that you enjoy yours as much as I do mine! Thanks! The directions DO tell me how to clean…but I really like to hear “real” people tell me their experiences! I don’t think the product manuals lie but they do have the bias of trying to sell their products… I appreciate the advise and may have to consider adding a 3rd sprayer to my arsenal just for the benefit of a glass jar! The table, as with most of your pictures, looks better with a cat on it! Love these pictures! I can’t help but giggle when I see Kristi’s cat in the photos – we have a photo bombing pup, that insists on getting into EVERY picture possible – if he even hears the camera ‘beep on’ he comes running! 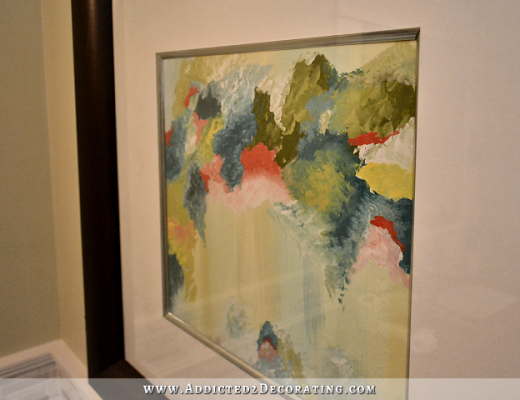 LOVE the direction that you are moving with the colors Kristi!! I’m SO happy that you are doing some fun decorating again! I agree too. I always enjoy it when Peeve makes a guest appearance in Kristi’s blog photos. Looks great! May I suggest getting a couple cans of scotchguard and spraying those seat cushions when you are all finished. I sprayed some accent chairs in my living room and I love how they just wipe up with warm water, even sticky grape jelly came right off! I know you don’t have kids, but white at the dining room table makes me so nervous! I thought the same thing…love Scotchgard! Anything that gets on my chairs wipes right off and you can’t even tell it’s there! I prefer the black table and green chairs. Looks great! I liked the table in green, but I like it better black! Can you throw your floral/paint-ish fabric in one of the pictures, so we can see that in the mix. Regarding window treatments, as much as I love the idea of black, I’m feeling like full drapes in black might get pretty heavy and dark in there (even with the white walls, floral/paint-ish fabric, etc.). Might be better to stick to roman shades on all the windows. But, then you can’t use your amazing acrylic rods. 🙁 Would it be crazy to pull in some other color? Like coral or yellow? I was actually thinking of coral! I’m also worried that the black will be too heavy and dreary, and now I’m thinking something really bold and bright on the windows would be good. OMG. TOTALLY agree on the Coral. Now that you’ve included the floral fabric in the picture, I’m thinking coral drapes would be very pretty and bright! Yes! Coral would look awesome! Glad you switched direction on the table and chairs, they look really nice. I liked the other too, but I think this look is better. I know that stripe fabric very well! When I worked at the decorating store, we couldn’t keep it in stock! It is a bit thin for upholstery as you said, but will work good for your use. You may consider this tip – add a fusible web backing. It will give it strength and keep the fabric from stretching when it is sat on. The weave of that fabric is a bit loose, and in my experience with it, it can stretch pretty good. I would love drapes made out of that floral fabric! It’s light, bright, and fun! My opinion is to do WHITE pinch pleated drapery with the Dwell watercress/green fabric from your June 30th post on the leading edge. Anything else on the windows would be a missed opportunity to subtly tie in your music room doors with the dining room! I like the coral limited to just your buffet, which I think looks great. Re: your host chairs, if you are game to put the work into to building them, I hope you’ll 1st revisit reconfiguring your darling wing chairs with taller legs & the Tutti Frutti watercolor upholstery on their backs. I think the best part about your new dining chairs is the height of them, which is key when you have a standard ceiling height. The wing chairs would look fab with the height and gravitas they give the room; however, with the table placed the way you have it, I’m guessing they would significantly block the view of the fireplace, and I can understand that they would be heavy to slide in & out (even with Magic Slides nailed in the feet). If you like how they look around the table, though, you could always bring over the armchairs that you are planning to put on each side of the buffet when you have company, and move the wing chairs to the side of the buffet temporarily (does the door hit them?). If the wing chairs are definitely out as host chairs, I think the armchairs from the set would be great host chairs if you wrap the back completely like the photo from Blesser Home you showed in an earlier post, in order to provide enough contrast/interest with the set. I’m a designer so just my 2 cents! Really enjoy your site. One last thing: I would strongly suggest laminating the b&w striped fabric on the seats. There are tutorials online for fusing it on if you don’t want to send it out. Your fabric source link isn’t working. I love the decision. And I love green, but the combo of green chair and black table seems better to me. Loving this choice. I can’t wait to see it finished! Don’t forget to post pictures of it all done! The table and chairs looks very nice, Kristi. I’m glad to hear you are reconsidering the black draperies. This is so exciting. The dining room is going to be a riot of color … in a very tasteful way. That floral fabric probably would make nice drapes. I can’t wait until the end of this story! I also think that the striped chair fabric will look stunning with the black curtains with the Greek key trim. The table looks so much better in black! The green made it look farmhouse to me, and that clashes with your over all classic look. The chairs are so pretty in green, and on the chairs it looks less matchy with your kitchen. Not sure why, but seems more balanced. I am not sure about that fabric on the chairs, I have a feeling you will be removing that fabric after a couple are done. What if you did white curtains with the black and white stripe edging? Then find some fun fabric and bring in coral via the chairs. I am so glad that you went with black on the table! When you painted it green the first thing I thought was “Oh no! it looks like the country table that my mother-in-law had.” The black adds that touch of sophistication to a traditionally more casual style table. This fits in much more with the classy with the unexpected rustic added in style you have in other parts of your home like gold and concrete in the kitchen. Lol…I didn’t thing about that, but that’s a good point! How exciting! Love how the different components look in the first photo. Sometimes you plan something one way, and life redefines it for you! Unique and beautiful!! What about a white faux silk curtain? You could get some colorful tie backs and drape them for a very luxurious look. Also I love the look of the chairs and table, it’s so rich and elegant. What if you nixed the coral in the room and repainted your buffet black or green for a uniform black, green and white look? And maybe find some great brass handles for it? Just a thought, bc the look of the table and chairs looks so wonderful with the fabric and the 3 main colors. I’m sure whatever you do will look amazing! Love the classic black base! I’ll admit there is no way I can “be in your head” to visualize the finished product so looking forward to each post! The table is stunning. What black paint did you use? I just used pure black Behr paint in a satin finish. I don’t think it’s on a paint chip. I just go directly to the paint desk and ask for pure black. Thank you for the info. I have a table I want to paint and the finish on your table is exactly what I am looking for. The watercolor fabric makes the whole ensemble. Just a pop of color in the right places. I really did like the green table, but I think where you are headed also looks great. Everything ties together without being matchy matchy. I love the table painted black! I liked the green too, but wondered if it might look a little too 90’s country. I think the green chairs with the modern stripes are a much better and less 90’s look. Can’t wait to see it all put together! And I really, really hope you go for coral curtains. That would look amazing! I’m loving the direction you’re headed in, so I don’t know why I need to add my two cents….but I think the drapes would look beautiful in coral with the black Greek key edge. I think it would tie in nicely with the buffet. Also, was wondering if there is some detail on the chairs that could be highlighted with gold to really tie in with your beautiful kitchen cabinets. Kristi, once the table and chairs a finished, why not set up the table as it will be when you finish. Either with dinner settings or with whatever accessories you may use when the table is not set for dining. Doing a vignette may give you a better ‘feel’ for what type of window coverings you prefer in the room. It has helped me before so maybe it might be useful to you, too. Can’t wait to see the finish! The black is very nice,and I while I realize your decor dilemma, I personally still like the all black chairs better 🙂 As for the black and white stripe fabric,maybe with thinner stripes, but as is, me no like, sorrryyy, it’s too cartoon prison uniformy like. But then again what do I know about decorating? Nothing,nada xD so it’ll probably look beautiful! I love the black!! I wasn’t really wowed with the green before but now the chairs look awesome! Great job! As always you manage to continue to work your magic (talent)! I really liked the green on the table but the black with green chairs makes more sense now that you have made those changes. I think the top of the table is beautiful and how fun the bold stripe and your colorful accent fabric will look on your chairs. I can’t wait to see it. 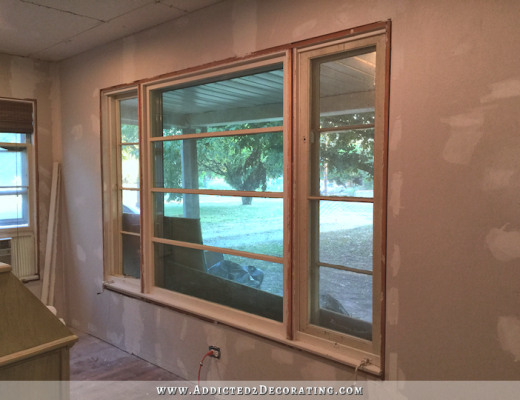 The window treatments will come together just like everything else. Happy creating! LOL. When I saw the table with the green base last week I thought to myself “that would look better black and save the green for the chairs”. The table looks great, by the way. Much better. Looks much better than the green. And you’ve done wonderful work as usual. But I’m not a fan of the green chairs. Or the striped fabric. The whole thing looks too busy and jarring to me. I know you are a fan of color and so am I. But the whole combination look garish to me. I think it would look much better with black chairs and maybe a solid green on the seats. Just my opinion. You must please yourself. I did this colour combination on a kitchen table and loved it. Your’s looks superduper….great. Love the black! Was planning to paint the base of my table white and the chairs either white or another color. You have inspired me to paint the base black and then decide about the chair colors. Thanks. WOW! I wouldn’t have thought I would have liked green on the chair, but it really makes the black and white stripe pop (ha ha, didn’t think I’d like the green cabinets in the kitchen, but they’re fabulous too!) and your floral fabric looks lovely next to it as well. You have such a great eye for color and knowing what you like! I have a terrible time mixing fabrics in my home. Is there enough of a black in the floral to make it”go” with the stripes? I just have the worst time making sense of the mixing and matching of fabrics. How do you know what goes together? There’s not really any black in the floral fabric, but I plan to add black piping and trim to the chair. I don’t really know that there are any hard and fast rules when it comes to mixing fabrics, but I generally try to find one fabric that has all of the colors that I want to use (in this case, the watercolor floral), and then pull colors from that for other fabrics. I like to mix a pattern like a floral, with strips, a geometric, a solid (or two or three) of various textures. I think black piping with the floral fabric will look fantastic, but I wonder if the fully-upholstered chairs will be heavy or cumbersome to slide back and forth when sitting at the table. Personally, I think I’d place them by the buffet and stick with the armchairs (painted black) for the ends of the table. Also, switching to black for the table base has upped the sophistication level (in my humble opinion). 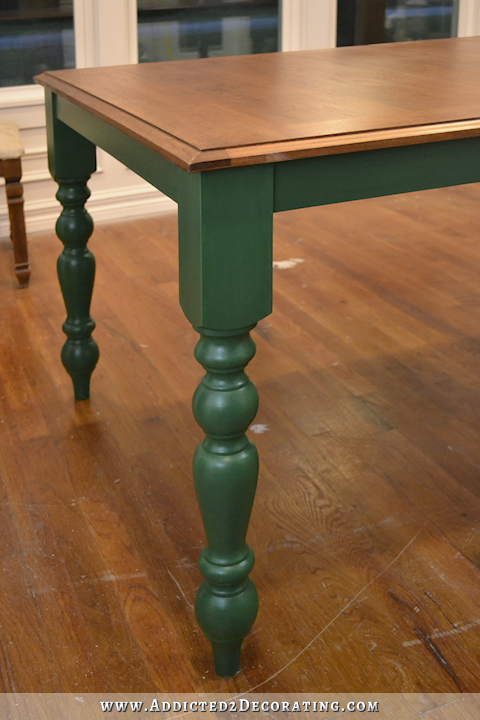 I thought the table had more of a farmhouse-kitchen look when the base was green. We have wood floors in the dining room and if the chairs have felt on the legs it will be easy to push them in and out. Have you thought about maybe a tiny touch of rub n buff highlight somewhere on the chairs? Maybe along that arched piece above the caning or on the very bottom portion of the legs? I guess I would have to see it, but mostly solid black drapes sounds really, really heavy! Was just coming here to the comment section to say Rub N Buff would be nice on the finials on the chairs! What about a very soft gold drapery to play off your brass fixtures. Gold always looks so good with green and black. It is my fav neutral!! LOVE!!!!!!!! It’s going to look so amazing when it is done. Great job! love the table BLACK !Help me out please .Bought Deglosser to use on my cabinets to prepare them for a darker stain. We are confused why the deglosser is making them so shiny and smooth.Is it suppose to do that ? we expected it to DULL them. I have to admit, I still prefer the green table, personally. But given that the stained cane didn’t work out and that you’ve committed to using the black striped fabric, I think it was a wise choice to swap the colors. Black fabric on black chairs just wouldn’t have looked right next to a green table. About the drapes… I’m thinking that you have a lot of square horizontal and vertical lines in your room (the table, the chairs, the wainscoting, the striped seats, etc.) and I’m wondering if maybe the drapes wouldn’t be a nice spot to break that up. Maybe back to a floral pattern or just some nice bright solid color panels. Just a thought. I liked the table legs/apron green, but I too, am really loving it black. I think it has taken the table up a notch in sophistication. The chairs look great painted green, but now I’m wondering how much more classy would they look if they were painted black and upholstered with the black and white fabric, then have your draperies in coral to mimic your buffet and the watercolor fabric for the end chairs. I think that combination would look really super stunning and gorgeous….black, white, coral and the watercolor fabric. Classy color combination without it being a kaleidoscope of too many colors…..does that make sense? I was thinking the same thing! I think it would look so classy and put together! I was thinking the same thing! I think it would look beautiful and so put together! What about white curtains with a band of coral, or a band of the patterned fabric (if it looks good in a narrow strip)? As always, your work amazes me! I too think the black base is more sophisticated. But rather than go to the work of building two end chairs, why not use your matching armchairs and pad the backs and upholster them in the watercolor fabric with black piping, leaving the legs visible and painting them black? I saw a show on HGTV a year or so ago that did this, though they simply sewed a slipcover for the dining chair backs after wrapping them in foam. I am so happy you are doing the chairs green! Can’t wait to see everything done, now. This might seem like a nitpicking question… but are you going to spray paint the undersides of the chairs green? I know you won’t see them when they are upholstered but as one who paints furniture for a living I always paint the undersides of any chairs that I do..!! Wow! What a difference. I hope the paint adheres well to the cane. The finials on your chairs look like they were just made for your chandelier! I don’t think you could have found more perfect chairs for your room! I LOVE your chairs. And, I LOVE a bargain! So, that makes them even more wonderful! 🙂 I’m so glad you painted them all green and you painted your table black. It’s going to look marvelous!! I love seeing the daylight through the green cane! It’s so happy!! 🙂 Here’s an idea…can the wing chairs go in the music room? I seem to remember that you were thinking about having a sitting area in your music room. Maybe the wing chairs could be perfect in there? Regarding the window treatments…I’m kind of leaning toward white draperies with the green edging that mimics your music room doors. (at least today I am.) 😉 I know you will figure out the perfect window treatment. It’s all looking gorgeous! Well I never! But after reading what you tried to do on the cane chairs. I completely understand you painting them. And the black and white material will look fantastic. The table I love along with your cat sitting on it. I’d have to say those coral draperies look absolutely stunning in that photo you found online because of the beautiful periwinkle blue on the walls. I’m not saying that they won’t also be gorgeous on your polar bear white walls, but I’m commenting to keep that in mind. Linen! Beautiful, soft, elegant linen to ground the colour and tie the beautiful scheme together. While I liked your table with green legs, I do think I like the black a bit better. It’s very sharp and I think the black and white stripe seat cushions will be a great contrast.